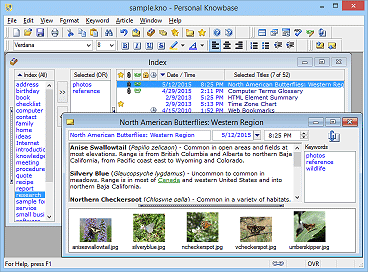 Personal Knowbase is a freeform personal information manager (PIM) that lets you carry your notes with you and access them using any Windows PC. With its intuitive interface and ability to handle large amounts of information, you always have your information at your fingertips. Personal Knowbase's keyword-based system enables you to index your notes so that you can quickly call up and review related notes all together. Install Personal Knowbase directly to a USB stick, memory card, or other portable media. Run the software in a self-contained environment from the removable drive without leaving any personal information or settings behind on each PC you visit. Your software, data, and preferences all travel with you. Get information for installing Personal Knowbase to a USB or other portable drive. Drag clippings from your work into Personal Knowbase. Capture ideas as you go. Never again scribble down notes on scratch paper only to have to type them back into your own computer later. Keep your information private with password protection. Doesn't change settings on visited PCs. No need to re-install on every computer you use. Use Personal Knowbase at work without violating a company's policy against installing software on their computers. No extra cost to install both on your local computer and on a flash drive. Full-featured portable note-taking and PIM software! Not a watered-down feature set for portability. Changing Drive Letters? No Problem. When running from a portable drive, you can load Personal Knowbase data files from that drive or the local computer. If you store your data files on the flash drive, the software knows to look for them there, even when you move to another computer using different drive letters. How to install Personal Knowbase on a portable drive.